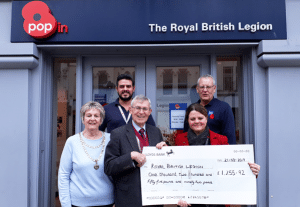 Colchester Mayor Cllr Peter Chillingworth, presented a cheque for more than £1,255 to the Royal British Legion (RBL) at its pop-in centre on Colchester High Street. The impressive sum was raised through several events organised by Mayor Chillingworth to commemorate the centenary of the Armistice last year. On 3 November, a special Firstsite screening of Stephen Spielberg’s 2011 film, War Horse, raised £126.82 for the RBL. The matinee also featured a short introduction by the distinguished author and academic, Andrew Phillips, entitled Colchester in the Great War: Training troops, ‘breaking in’ horses, healing the wounded. In late November, to coincide with the start of National Tree Planting Week, Mayor Chillingworth invited the public to help create a new woodland, Tommies’ Wood, in Lower Castle Park, as a living memorial to all those who lost their lives in the Great War. Through a minimum donation of £10, sponsors were able to dedicate their tree to an individual or group, choosing from a variety of native tree species including birch, hazel and alder. Each tree was accompanied with an official commemorative certificate recording the details of each dedication, and a record of all the trees and dedications were preserved in the Borough Archives. After costs, Tommies’ Wood raised £304.10 for the RBL. Castle Park’s widely celebrated World War One floral display raised £825 for the RBL, through the sale of several life-size figures created by Suffolk-based willow sculptor Jo Hammond. The hugely popular display, which also featured a WW1 tank, stood proudly in front of Colchester Castle from late June until it was dismantled in mid-November. Over five months, thousands of sightseers enjoyed the colourful and poignant tribute, which symbolised the town’s important role during the First World War. The stunning attraction, featuring over 9,000 bedding plants, attracted widespread praise and even national media attention. The Mayor of Colchester, Cllr Peter Chillingworth, said: “I am immensely proud of all the imaginative and unforgettable ways Colchester chose to commemorate the centenary of the Armistice, and would like to thank the public for helping to raise such a significant amount of money for charity. Kate Green, RBL’s Area Manager for East Anglia & Essex, said: “The Royal British Legion is very grateful for the support of the Mayor of Colchester as we marked the centenary of the end of the First World War.